Please sign up in advance below or contact: front.desk@nwfencing.org. NWFC is a non-profit and committed to keep training costs as low as possible. Volunteers help NWFC operating efficiently by assisting in many areas. Volunteers help run tournaments, host fencing demonstrations, special events, fundraising and even keeping the club neat and clean. When you volunteer at NWFC you will learn more about fencing, meet other members of the community, help develop the sport of fencing, and gain a sense of investment in the club. We encourage all members of the NWFC community to volunteer, whether they are athletes, parents, or friends. Check this page often and watch for special announcements the club emails. Hours tracking is also very important middle/high school volunteers and adults whose companies match donations are all vital to the success of the club. Some companies will match volunteer hours with a direct donation to the club. Please check if your employer will match volunteer hours and be sure to note this when you sign-up. We will send you an email reminder to log your hours with your employer. 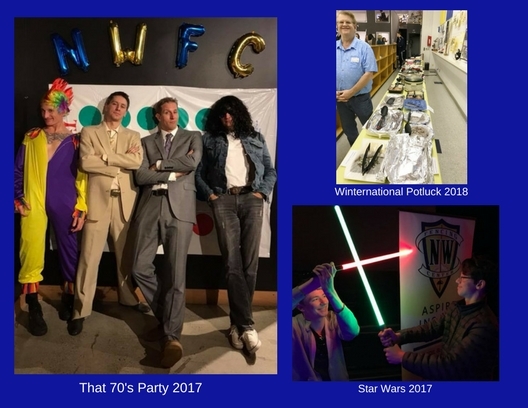 NWFC would not be the club it is today without the untold hours of service by hundreds of volunteers. If you have any questions, please stop by the front desk or contact us at front.desk@nwfencing.org or 503-277-2237. Please consider hosting a visiting athlete. Contact our housing coordinator Lika Vogler at the front desk to sign up! We need 2-3 more housing families! We need 4-5 more housing families! Successful summer camps are dependent on host families! Please consider helping us welcome some talented visiting fencers to NWFC. Each summer we have out-of-town fencers from across the country and the globe who come to train at NWFC. Your help is vital as it dramatically reduces the cost for fencers to attend the pre-national, foil & epee international camps. In turn, these fencers add to the quality of our camps by bringing new training partners with different perspectives and experiences. The friendships and “esprit de corps” that grows between fencers at camps carries over to future tournaments where they support each other and build lifetime relationships. Ask any parent who has hosted and they will tell you it was a rewarding experience for their household and especially their fencer. Camp housing cost is $35 per night and paid directly to the host by the guest fencer upon arrival. As a host family, you provide daily breakfast and dinner, transportation to/from airport and rides to/from the club during camp. We hope you will consider joining us in our efforts to provide this valuable amenity to our fencing community. Contact our housing coordinator Lika Vogler at the front desk to sign up! If you are interested in serving on the board or one of the organization’s vital committees, please contact Larry Crepeaux, Executive Director or Charlene Welch, President.